Kenneth Thomas and Ralph Kilmann developed their model of how we deal with conflict whilst working together at the University of Pittsburgh. Their ideas are based on research observations and on well-respected psychological theory (Jung, Blake & Mouton, etc). The model describes how individuals behave when faced with conflict: a situation in which the concerns of two people appear to be incompatible. Like many such models, there is no one right style: to handle conflict effectively requires both parties to be versatile. But we will each have our preferred style(s), and it helps to be aware which ones these are, and how to extend into the other boxes on the grid. 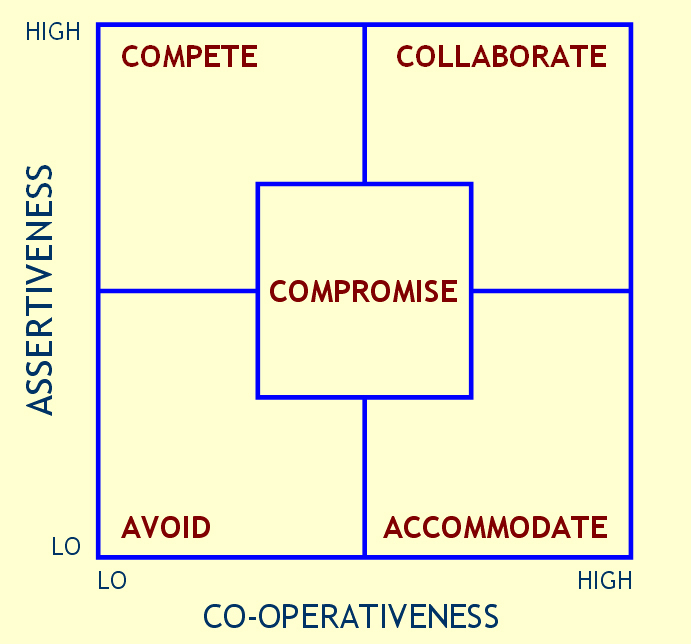 COMPETING: We aim to assert or ‘win’ our position with no concern for the needs of the other person. We use whatever power (rank, intellect, etc) we can to achieve this goal. Competing behaviour can be effective in emergency situations, or where tough actions are required that are not in the interests of the other person: e.g. cost reductions, redundancies, rules & discipline. ACCOMMODATING: we neglect our own concerns for the interests of the other person. We tend towards selfless generosity – even charity – and are entirely non-competitive. Accommodation is useful for the longer-term: e.g. giving in on this point will build better relations in the future, or when harmony is more important than this particular issue. AVOIDING: we don’t pursue our position, or that of the other person, and so don’t address the conflict. We might simply not talk about it, postpone the issue, or withdraw from the situation. Avoidance is effective when the situation is charged with emotion that will prevent rational discussion, when you have no prospect of satisfying your concerns (e.g. company policy) or when other people might be better placed to resolve the problem. COLLABORATING: we actively work with the other person to satisfy fully the concerns of both parties. We analyse and gather data, seek out underlying causes, and try to see the issue from both sides, so that neither side has to give ground. Collaboration helps to merge very different insights on a problem (e.g. the solution is one that neither person would have produced alone), to gain commitment from others who will have to implement the solution, and to build long-term partnerships. COMPROMISING: we aim for a solution that both parties can accept, which partially satisfies their concerns. It requires a willingness to give and take, and assumes both sides are able to give ground. Compromise is useful for achieving a temporary settlement to a complex issue, or an expedient solution under time pressure, and when satisfying your concerns, whilst important, is not worth the effort or disruption of more assertive styles. The classic 'Win - Win' outcome that we often seek when resolving a disagreement by negotiation should really be achieved through Collaboration, but is often the result of Compromise. A Compromise Win - Win will resolve the immediate conflict, but may not address underlying disagreements or differing attitudes. 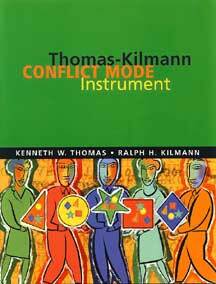 The Thomas-Kilmann Conflict Mode Instrument is a widely available self-scoring questionnaire that identifies your preferred and back-up approaches to handling conflict. It's available from a number of international publishers, or via Ralph Kilmann's website - where you can also read more about the model, its origins and its applications. © Chimaera Consulting Limited 2002.